President Donald Trump seems to be enjoying his time being “on top”- or his resemblance, that is, as a man’s photos of a cloud appearing look like the President is going viral on social media. The photographer, AJ Brackins, captured the photos in Gaffney, South Carolina. He posted the photos to his Facebook page on Thursday, coincidentally Trump’s 72nd birthday also. Brackins was able to capture multiple angles of the cloud formation. 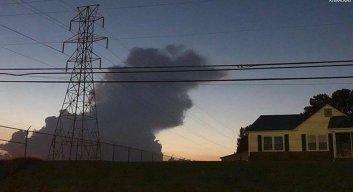 The post received comments from Brackins’ friends and contacts in the social media platform with most agreeing that the cloud formation indeed resembles Trump. There are some funny reactions to the “Trump Cloud” on social media. Trump haters did not lose the chance to slam him again with that innocent photo. This isn’t the first time that someone says a cloud formation resembles Trump. It was also claimed by some back in 2016 saying the cloud formation they captured then that resembled Trump was a sign that he will win the presidency. Well, at least it didn’t “cloud” their judgment and Trump did win.